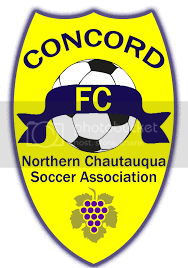 NCSA/Concord FC is excited to announce that we will be accepting online registrations (link at very bottom) for the Travel/Rec Fall Soccer league beginning today. This opportunity is a nice option for those who want to take the next step after summer rec soccer. Teams feature a more competitive atmosphere while keeping equal playing time and a focus on skills development. Athletes will be expected to be at two practices per week (Monday/Wednesday 6-7:30) and a double header of games on Saturdays. Travel is limited to the southern tier (Bemus, Falconer, Westfield, etc.). Our home/practice field is behind Holy Trinity Church in Dunkirk. The season begins August 20th and runs through October. Registration is $65 plus uniform fees (if applicable). The Fall season uses the Spring Concord FC uniforms. If your athlete played the 2017/2018 Spring seasons or the 2017 Fall season they do not need to buy a uniform. However, we strongly recommend that all players try on their uniforms for proper fit before registering. Any uniform piece can be purchased individually during registration. First time travel players will need to buy a uniform. This is the last season for these uniforms. Purple training/practice tops are only required for athletes new to the program. They are the same purple shirts as last Fall and Spring. Fall Registration will be open until July 23rd, 2018. This has to be a firm deadline as we need to report the number of teams to the fall travel league. Late registrations will only be accepted if there is availability on the teams declared. We appreciate your understanding. "I just want to give a huge THANKS to the coaches! This is our first year in the Fall Travel Soccer League and I was so excited and impressed to see how much our kids have learned! The coaches in this league are so knowledgeable and work great with the kids!! The players that I saw at the games yesterday were playing positions, pressuring the opponents defense, scoring goals, making beautiful passes, and the most important; working as a team and listening to their coaches (even in the heat they worked hard and had fun doing it)! The parents were awesome and supportive too, which is great to see! What a great organization to be a part of! Thank you to all involved!! Congratulations to the players and coaches and all their hard work!! I look forward to an awesome season!!"